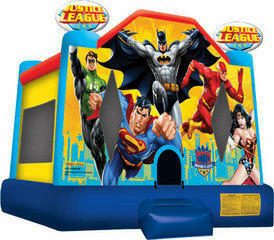 The Justice League is a 15' x 15' bounce ride. Can be delivered or customer can pick up (please see or ask about our delivery rates). Delivery includes set up and break down of the bounce ride. For your safety, all bounce rides are secured and strongly recommend they be set up on grass only!.